VATICAN CITY (CNS) — The World Meeting of Families in Philadelphia next year will be open to families and people of different faiths, including no faith at all, to engage the wider society in dialogue and to serve and strengthen all families, organizers said. The gathering Sept. 22-27, 2015, “is meant to be a gift not just for Catholics in Philadelphia, but for every person of good will in the Commonwealth of Pennsylvania, the surrounding regions and the wider world,” said Archbishop Charles J. Chaput of Philadelphia. Meetings that bring together thousands of people from many different parts of the world with different experiences are a source of “tremendous joy” and grace and “have the power to transform, in deeply positive ways, the whole public community,” the archbishop said at a Vatican news conference March 25. 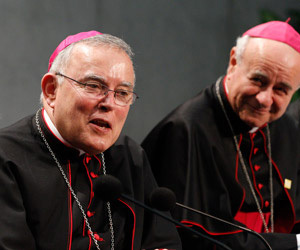 Archbishop Chaput visited the Vatican with Pennsylvania Gov. 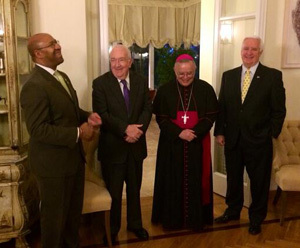 Tom Corbett and Philadelphia Mayor Michael Nutter as part of a delegation of government, religious and community leaders meeting with Vatican officials to plan the 2015 international family gathering. They also expected to have an audience with Pope Francis during their March 24-26 visit. Archbishop Vincenzo Paglia, president of the Pontifical Council for the Family, which is helping prepare the meeting, said confirmation could come as late as six months before the event. The aim of the global gathering will be to help all families of the world and accompany them “with an intelligent, courageous and loving” pastoral approach, the Italian archbishop said. The Pennsylvania delegation to Rome to meet with planners for the 2015 World Meeting of Families paid a call to U.S. Ambassador to the Vatican Kenneth Hackett on Monday, March 25. From left: Philadelphia Mayor Michael Nutter, Ambassador Hackett, Archbishop Charles Chaput and Pennsylvania Gov. Tom Corbett. These are the reality facing many people today, “so not to deal with those kinds of issues” would be to ignore the situation many people live in, he said. It is a Catholic gathering and it will emphasize Catholic teaching about the family and openness to life, he said. A marriage is more than problems. “It’s a grace, it’s a gift and we really want to start there and not start off with problems and differences and condemning. We want it to be an occasion of honest reflection, the joyful commitment to family life,” he said. Corbett and Nutter told Catholic News Service they are excited about hosting the World Meeting of Families and would love to have Pope Francis attend. They cited a real need to help today’s families. The family is “so important to society and, particularly in this day and age, I think we see very much a greater need for greater emphasis on the family,” Corbett said. More attention and focus on the family “would help solve some of the problems of cities and countries,” he said. Nutter said making Philadelphia the destination of a papal visit would have “great meaning to the millions of Catholics and other people of faith” in the United States. The pope “is a world leader, and so whether you are Catholic or not, people are paying attention to what’s going on with Pope Francis, and certainly with the Catholic Church,” he said.